Robinson’s Run Cemetery is a nonprofit, multi-denominational cemetery located in a beautiful and bucolic setting in South Fayette Township. Robinson’s Run was incorporated in the early 20th century but some of its graves date back to the 1700s. For well over a century, families have chosen Robinson’s Run for its dignified and beautiful setting. A chapel is located on the cemetery grounds and is available for funeral services. 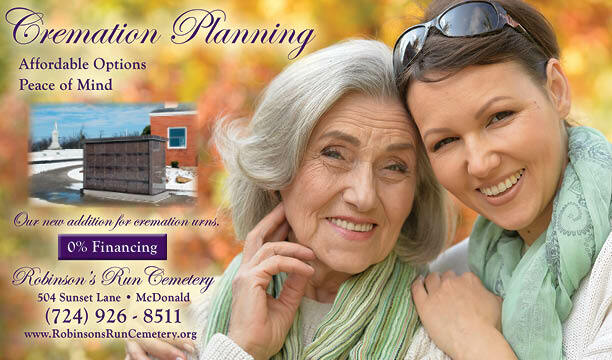 The cemetery is perpetual-care funded and options are available for every budget. Copyright ©2019 Robinson's Run Cemetery. All rights reserved.